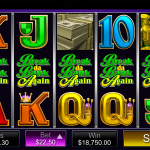 Break Da Bank is a classic slot game coming from Microgaming. 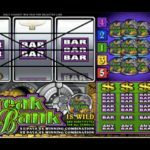 As many of you already know this slot served as an inspiration for designing the Microgaming mega hit Break Da Bank Again and later on Break Da Bank Again Mega Spins. This is why Break Da Bank is probably one of the most popular classic slots coming from this provider. The slot has luxurious looking symbols which point to wealth and big winnings. Even though the slot doesn’t have any modern animations it still has an overall attractive look. Like in any other classic slot it all comes down to the payouts. The highest payout in the game comes from the Wild Symbol. The wild can land stacked on any of the five pay lines and awards the biggest payouts. Players can score 1.000, 1.200, 1.400, 1.600 and 2.400 coins if the wilds form a winning combination on the first, second, third, fourth or fifth pay line. Because the payouts increase with the number of pay lines it’s always recommended to play the game with all pay lines active. Also the wild will substitute for all other symbols. If one wild is involved in a winning combination the payout will be doubled, while if two wilds are involved the payout will be quadrupled in size. The rest of the game symbols also have decent payouts. The Dollar Sign will award a great 160 coins payout for three of them on a pay line. The Triple, Double and Single Bars symbols will award an 80, 40 and 10 coins payout respectively, while any Bars combination will award a small 5 coins payout. Despite its old age and simple design Break Da Bank still has the potential to produce big payouts. This is why many players still like to try their luck on classic slot games, chasing for the big win. Pizza is the most popular food in the world because it is so awesome! In Belissimo (a 3 reel slot by MicroGaming) you won’t only spend money on pizza you could earn big $$$.